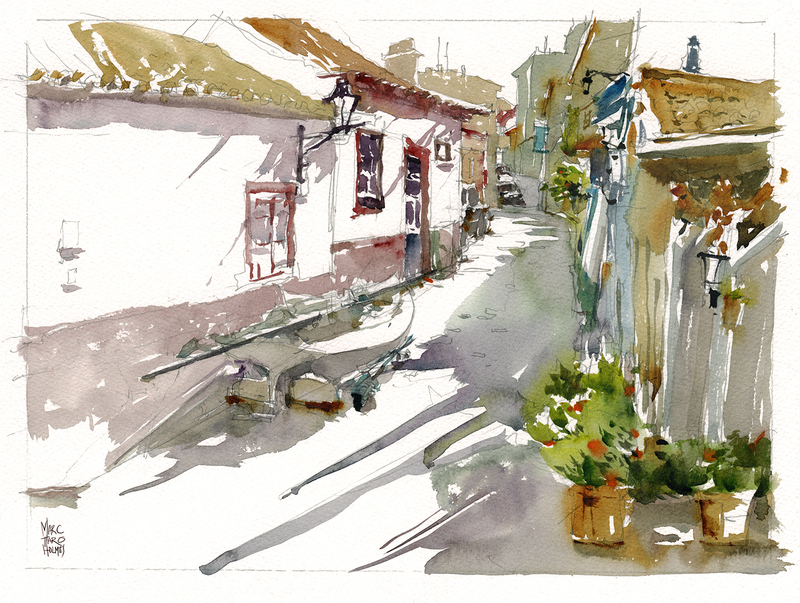 This just in: During this back alley demonstration painting in Alvor, sketcher Anne-Laure Jacquart was able to get quite a good recording oft my painting in progress. She’s cut together a 12 minute video, showing it from pretty much start to finish – (skipping the boring drawing part at the beginning :) – even managing some great close up shots of brushwork in action. Impressive what she’s captured looking over my shoulder! That’s what I call a Taro treat! Thanks Anne-Laure. Thank you, Marc and Anne-Laure, this was wonderful! I learned a lot about brush work here, changing color, and leaving things unsaid. But I need to ask: 1. What brush are you using here, Marc? It is so versatilie. and 2. Why did I ever practice those big, even washes so much??? I’m still trying to color between the lines I think. What an eye opener this video was, thanks again. This is great! Is that a Raphael Petit Gris? I love that brush..I recentlybought one. Fun to see the finished work and looking at it’s progress.Thank you. That was very special! If you can’t be there this is definitely the next best thing!! Thank you for letting us be a part of this experience. Thank you so much. For free? Too kind, I’ll buy another of your USK books. 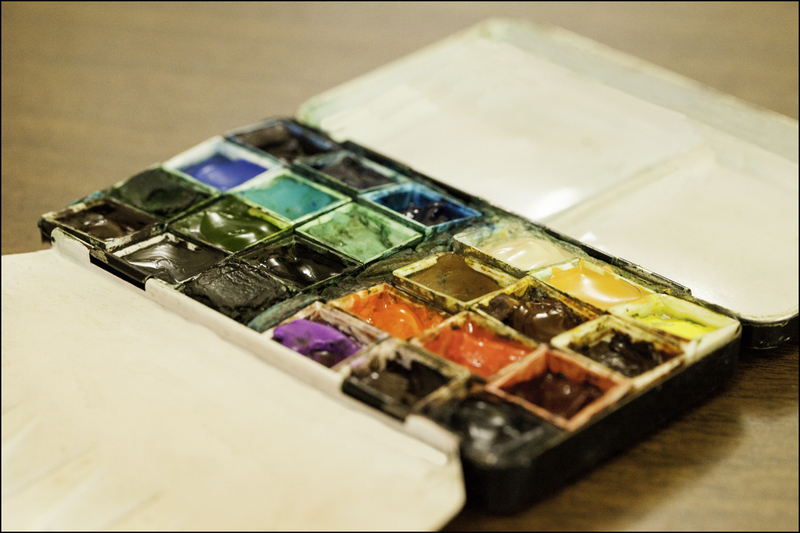 I would also like to know what kind of brush…and your color pallette..it looks like a nice choice of old world colors. Great demo…thanks to both of you. Thank you Marc for sharing your talent for sketching and painting. You could paint anywhere in the world and it would be fantastic. Everyone of us who can’t visit the wonderful scenic countries that you do, appreciate your sharing these videos and your vision. Outstanding to say the least. What a gift- I so very much enjoyed this and know I’ll watch it again at least 100 times. You didn’t need speech as your brush did all the talking, but one thing you said was brilliant – you just have to live with what happens. Perhaps that’s the secret to how you stay so calm amid such color, detail and distraction – it all is permitted to simply flow. Thank you Marc and Anne Laure. Ms. Jacquart really did a fine job capturing your technique in this video – thanks to both of for the lesson! I too would like to know which brush that is, although I suspect it’s the operator making the magic. Marc, can’t thank you enough for this very interesting video.. I’m in your class, have your book and enjoy every minute… Wonderful !!! Wow ! Thanks Marc and thanks Anne-Laure. It was my favorite water-colour of your trip in Portugal, and seeing how you made it was a great teaching lesson. You are so cool and relaxed !!! (I have to work on that…). Everybody is asking about your brush…. but what paper are you working on ? So, that’s my Fabriano Artistico 140lb cold press. It’s a bit smoother than Arches for instance – and seems to be a bit stiffer sizing – so I can pull water a long ways on it – which of course I like! i LOVED it. I would have liked to see it drawn too! not boring. do you mind sharing what paper you were using? i have a couple of those brushes and like them a lot. loved seeing the paint going on! thanks! i love the craftsy class and will watch it again! THANKS! . I will have to get some and try it for my sketching. your painting was beautiful by the way! What I aspire to, even if I don’t intend to apply it to realism. My favorite Craftsy instructor…. This is great! I love how the image appears out of nothing! Such a good control of the brush strokes too! I mostly have the problem that with quils I it lays down too much paint. I am so impressed by the sensitivities used in setting down the tiniest of color and marks. As a bold abstract painter this sets my mind to whirling. I have to try this technique and see what I can create.. Thanks for that wonderful and inspiring video. I think I will watch it many times. Ahh such fun to watch. Sort of en Plein Air Street Craftsy! Amazon has that wonderful daVinci Artissimo #3 brush with a 20% discount coupon…a deal I could not pass up. Really enjoyed the video and learned so much about handling a quill properly. Thanks for sharing! Have a question: was it all done on dry paper? Any pre-wetting? The paint flowed so beautifully, which I’m sure is owed to your skill with the brush. Thanks again. Jan W.
Watching you paint is a bit of magic! I’m looking forward to the Galway workshop. Bought a Kremer palette – looks like yours, but it has only two tracks for the half pans (total 14). Your central area for pigments is completely loaded with half pans. Did you glue them in or did it come with three rows of tracks? Maybe it’s a different brand? Please help resolve my confusion if possible. Thank you so much! Look forward to meeting you in person. I am Leonor from Lisbon and I went to se you working on the 2 nd April in Sagres. It was a fabulous experience and I’ been folowing your site since then. I can’ t go to Irland in September but the next time you come to Europe let me know and keep a place for me and my friend Fefa. Hope your father don’t get worst. Hey, good to hear from you Leonor!